Roger Federer is behind a set in this update. 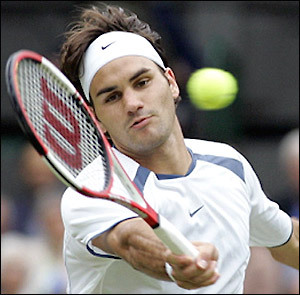 Roger Federer and Andy Roddick do battle for the Wimbledon championship. Can Federer win his 15th Grand Slam title? Or will Roddick delay the great Swiss’ run to the record? Follow along with our live blog and sound off below. Andy Roddick is leading the game with 6-5, grandslam 2009. Game 1: Roddick starts with a booming serve to win the first point. He’s served beautifully in this tournament and he’ll need it again today. A painless hold gives him the early lead. Game 2: Federer follows with an easy hold of his own. These two have played some very close matches over the years, despite Federer’s lopsided 18-2 edge in the head-to-head record. Game 3: Roddick continues to hit big serves and cruises to a hold at love. Both look sharp early on. Game 4: And Federer holds at love. No hint of cracking by either player on their serve so far. Game 5: The baseline groundstroke battles are going to be key today. Federer has the edge on paper and wins a point in this game after a long rally. Roddick wins another on a nice passing shot, then wins the game after handling a tough return and sending a gorgeous backhand winner up the line. This version of Andy Roddick just might be a problem for Federer. Game 6: Usually it’s Federer feasting off ill-advised Roddick net approaches, but it’s been the other way around so far here. Roddick wins the first point with a crosscourt pass as Federer rushes the net. Federer, though, serves his way out of trouble to keep us on serve. Game 7: The first point is indicative of the kind of extra effort you need to beat Roger Federer. Roddick hits a nice backhand volley that seems to be good enough, but Federer tracks it down and flicks a winner up the line. Like Federer, Roddick serves his way out of the hole. Game 8: Neither player has even flinched on his serve. A hold for Federer keeps up even in the first. Game 9: Roddick holds at love. Can we just skip ahead to the tiebreak now, or should we play it out? Game 10: Federer holds at love. He’s won 100% of his first serve points. A pretty solid number. Game 11: Roddick throws away the first two points and suddenly Federer’s got his first real look at a break. A huge first serve into Federer’s body, then another one down the line get Roddick to 30-30. Federer wins the next point after a long rally to earn the first break point of the match. Roddick saves it, then another one a few points later. Federer earns a third break chance and blows it on a forehand error that was called good before a Roddick challenge overturned it. Then comes a fourth break chance, which Roddick saves with a big serve. Another Federer error and another huge serve help Roddick gut hold a gritty hold. The battle is continue at this time. we will be updating the latest. Keep in touch.